Terry and Garry Radford have researched the name RADFORD in the Crich and Fritchley area. Their report contains several family trees so is in pdf format to retain the formatting. Click the link below. Thurstan RADFORD1 was born about 1585 probably in Crich Derbyshire England. He died and was buried on 28 April 1633 in Fritchley Derbyshire. He was a yeoman farmer. A yeoman is defined in the Oxford Dictionary as "a man holding and cultivating a small landed estate - qualifying by possessing land of an annual value of forty shillings to serve on a jury, or vote for the Knight of the shire"
Thurstan RADFORD1 was born about 1610 in England and died in 1696. Thurstan married Margery STEDMAN1 on 8 Oct 1635 in St. Alkmunds, Derbyshire, England1 Margery was born about 1615 in England. They had four children: Dorothy, Thurstan, Joseph, and Thomas. Joseph RADFORD1 was born in 1645 in Horsley Derbyshire, England. Joseph married Elizabeth of Holbrooke. They had one child Martha. Martha died in 1729. She married Thomas Radford of Woodhouse at South Wingfield on 13 July 1710. Thomas who was a Tanner died in1755 They had eight children: John, Elizabeth, Joseph, Martha, Sarah, Hannah, Thomas, Mary. THOMAS RADFORD2 was born in 1644 in Horsley, Derbyshire, England and was buried on 15 Nov 1723 in Horsley, Derbyshire, England. He had a residence in 1704.3 Hill Top, Woodhouse, Horsley, Derbyshire, England Thomas was baptised in Horsley although his father Thurstan was originally from Fritchley in the parish of Crich It seems Thomas spent several years in Fritchley, possibly on the family farm, as his first four children were baptised there. By 1690 when Thomas Jnr was born, the family had moved to Horsley Woodhouse at Hilltop. Thomas also owned land at Kirk Ireton. Hilltop was about half mile from Stainsby House where Elizabeth of Denby lived with her first husband, also Thomas, and when widowed married Thomas Jnr. George RADFORD was baptised on 14-03-1674 in Crich Derbyshire. John RADFORD2 was born in 1688 in Fritchley Crich Derbyshire, England and was christened on 5 Dec 1688 in Crich, Derbyshire, He died in 1769. On the death of his father he inherited Hill Top and in his will he left most of his estate to “my nephew John the elder of Stanley in the parish of Spondon"
During her first marriage she lived at Stainsby house, Horsley Woodhouse In her will dated 06-01-1737 Elizabeth left bequests to Thomas, William, and Francis from her first marriage, and John, Robert, Charles, and Elizabeth from her second marriage. Francis was her sole executor. Her eldest son Thomas died six weeks after her aged thirty-six. He was a bachlor. 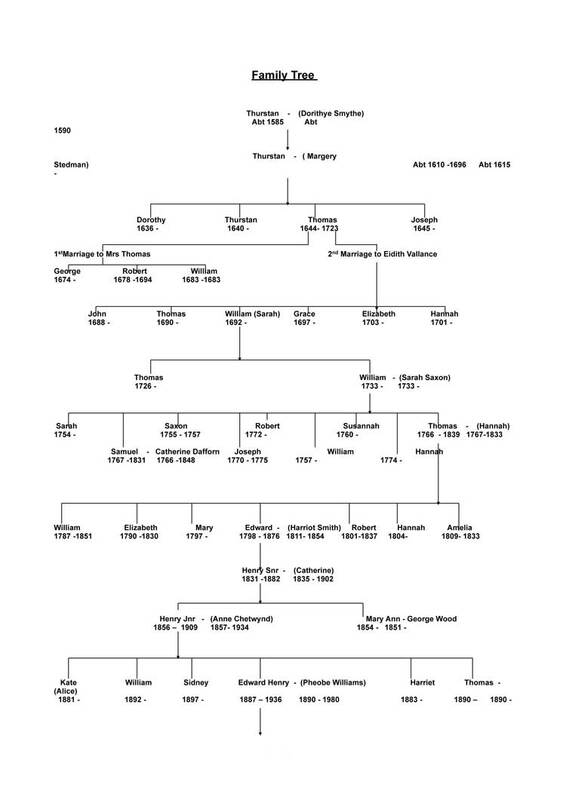 The Fritchley and Crich descendants of Thurston Radford went to Horsley and from there the descendents settled in various parts of the world from London, Warwickshire, New Zealand, and elsewhere. 1. Radford, Adrian Robert, Radford Family of Horsley (16 Jan 2006). 2. The Church of Jesus Christ of Latter-day Saints, International Genealogical Index (R) (Copyright (c) 1980, 2002, data as of June 2006). 3. Church of England. Parish Church of Horsley, Derbyshire., Parish Registers, 1558-1957. Church of England. Parish Church of Horsley, Derbyshire.